I am so excited to get these wine reviews up and running again! While I was pregnant with the twins, I couldn’t review any new wines and it was rough… what’s life without a good glass of wine? With four kids now, life is more crazy than ever and being able to enjoy a good glass of wine is a like a mental retreat for me. Because I’m breastfeeding, I can only have a small glass at a sitting, so I want to try wines that are hopefully wonderful so that I enjoy ever sip! My husband kept picking up this bottle of wine for about the first two weeks after the birth of the twins. I wasn’t able to have any during my recovery, so when he brought home the third bottle last week, I really wanted to put it to the test and give you all a review of it. 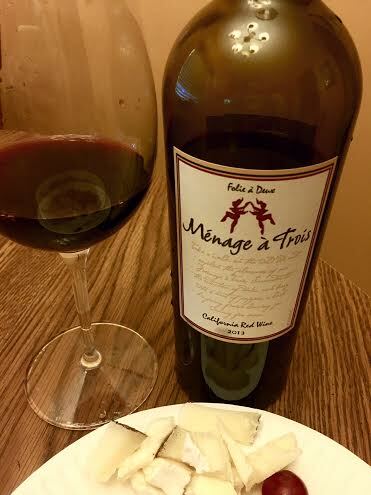 Menage à Trois wines are readily available in grocery stores and wine shops and are usually around $10-$15 a bottle. Taste: Smooth with flavors of raspberry jam and blackberry. It finishes with the richer, dryness that comes with most Cabs, and balances out the earlier sweet berry notes in the beginning. Not too dry or too sweet. It finished with a hint of tannins, but nothing too intense. I was pleasantly surprised with how smooth this 2013 California Red Blend was, as I usually am when I find a good wine for a cheap price. The sweetness from the berry jam flavors combined with the hint of tannins really give this wine a nice taste. I would say it’s the perfect “middle of the road” red wine. It’s the perfect weeknight wine to have with a chicken dish, one that you don’t need to think too much about and is an easy choice to grab at the store. I love it for the summer, when grilling chicken is almost a weekly occurrence in our house. It also makes a great sharable wine for an evening with friends or your spouse. Have it addition to a cheese plate appetizer, which is my new obsession thanks to my wonderful sister-in-law, and you have a match made in wine and cheese bliss. Not to mention, you can find it for a great price. I would give this 3.9 out of 5. Thanks for the review! Will definitely have to try this soon.